This beautiful cottage, on M-119 the famous 'Tunnel of Trees,' has been totally remodeled with a loft bedroom added (Perfect for the kids). The decor is truly Northern Michigan with authentic log hand carved beds(one queen and two double). All Ethan Allen Furniture or antique. White wicker porch furniture. Across the street take the gently sloping trail down to our private 130 ft. pure sandy beach. Once you step on the beach you will wonder if you are in the Caribbean. Wonderful white sand. Beach chairs and a cooler are available to take down to the beach. Enjoy an afternoon of relaxing in the hammock or on our 10 by 20 screened porch while reading that book you've been meaning to. All weather curtains can be rolled up or down. Make sure to bring lots of marshmellows to roast by the outdoor firepit while sitting in the adirondack chairs, watching the sun set, and enjoying a glass of northern wine. Ahhh pure bliss!!! Our complete (all newly remodeled cabinetry and appliances) and cute galley kitchen will keep your clean up a snap so you can spend your time visiting such places as Mackinaw Island, which is only a 45 minutes drive away to visit for the day, or shopping and fine dining in Harbor Springs (ten minutes) and Petoskey with a new casino and movie complex (20 minutes) which are close by. The famous Good Hart General Store is approx. 4 miles away with a great deli and bakery. And don't forget the many wonderful nearby golf courses. Widing's Way was bought and remodeled by Roger and Karen Widing, who own Widing Custom Homes in Traverse City. This 1940's cabin was a remodel project for the Widing's and their 2 girls in 2003. We enjoyed bringing the cottage up to date and decorating it in pure northern style. For years we have always enjoyed the Norman Rockwell beauty of Harbor Springs, the shopping,the beaches,and the drive along the tunnel of trees. We have many memories of wonderful times at our cottage, Widing's Way, and we hope you will also. One of the most beautiful places to see the fall colors in Sept. and October. Some of our most memorable times are sitting around the campfire, roasting marshmallows, and watching the sun sets. We also enjoy reading books on the porch, and most of all enjoying the wonderful beach. The owner was super attentive and answered multiple questions on moments notice. Have never dealt with such attentive and helpful owners. We had an enjoyable, relaxing vacation. The trail down to the beach was easy and we enjoyed it. The beach was amazing!!! Absolutely beautiful and like none other we have ever stayed at. We went to Petoskey a couple of times and enjoyed the shops and a couple movies. Spent another day at Mackinac and an afternoon in Harbor Springs. All are easy trips of 20-45 min. The kitchen is super small, which I expected. But the biggest disappointment was the kitchen not being very well stocked. This made cooking very challenging. I was glad I brought my own dish cloths as well and we bought a pot just so we could make mac & cheese. . . which we left at the cabin for others. The other thing I would mention is the décor is very animal/hunting like. I respect the owners taste and this is probably very appealing for many, but our 8 year old daughter had a nightmare her first night in the loft, of animals attacking her. (She never has nightmares normally). The bear rug with growling teeth in the loft had to be rolled up and put away to prevent troubling her and she still couldn't sleep up there the rest of the week. The giant moose head next to the loft probably wasn't helpful either. This is just something I will be sure to ask about in the future! The shower needs some work as well, as it was useless to have a temp control/knob, as it does it's own thing, often giving you a not-so-hot shower. We had a great, relaxing week and will treasure the beautiful memories forever. We had such a wonderful vacation. We took our grandsons and enjoyed the beautiful cottage, although the boys were a little afraid of the loft ladder, we just enjoyed the cottage, the yard, the beach. We had wonderful beach days, and easy day trips to the UP and Mackinac Island. We hope to go again. The owners are kind, and very pleasant to work with. Karen, I love all your cross-stitch work samplers! Beautiful!! Great house! It was very nicely decorated, neat, clean, updated and accommodating with amenities. It’s an absolutely beautiful area! It’s close enough to town yet far enough out. The beach is amazing although it is a light hike through a gorgeous trail to get down there. My husband and I have a 4 month old and the three of us quite liked the trek. We had breakfast at Mustang Wendy’s in town (I recommend Eggs Hemingway). We also ate at a fantastic authentic Polish restaurant in Cross Village north of the cottage called Legs Inn. We stopped at a local meat market (Tannery Creek Meat Market) to pick up some things to grill which the owners were so kind to ensure the grill was there for us even with our last minute reservation. They also left a local wine! The bridge to the UP isn’t too far so we took a quick trip up there to do some sightseeing. Petoskey isn’t too far either so we made a trip there to do a little shopping. I highly recommend this cottage and we look forward to coming back. Thank you for letting us enjoy this property! What a perfectly relaxing, beautiful little place. We never left, once we got here. Of course, that meant going to Leg's Inn in Cross Village before we checked in. Oh, darn. Fabulous,portion friendly Polish food in a quirkily awesome lakeside legend. Great Bloody Marys, too. Get the smoked whitefish spread to go. Then a stop at the Good Hart General Store, 4 miles north of the cabin, for yummy house made pot pies to go (so we can cook em at the house), and a bottle of really good wine. Oh, and a couple of pieces of cherry pie, too. To die for. And the cabin? Well, it's divine. Cozy, lovely northwoods decor, even down to the big stone fireplace and a moose head. Immaculate, and every need is pretty much anticipated. Plushy towels and washcloths, soft, high quality linens on all the beds, which are extremely comfy. Fully stocked kitchen. Perfect fire pit and real wood Adirondack chairs out front. Hammock, too. Look at the lake. Nap. Repeat. Gorgeous, white sandy beach, perfect for walking great distances. Or not. Great for just sitting, too. Friendly, responsive owners. What more can I say? We cannot wait to go back. We stayed there last week - family of four(2 adults and 2 kids). 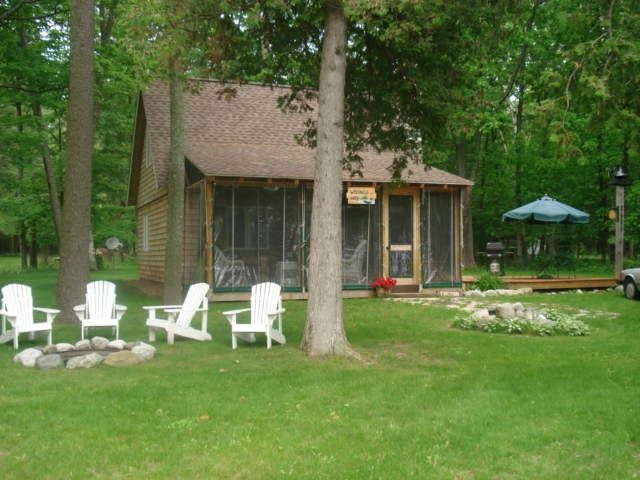 It is an excellent cottage in the middle of tunnel of trees, lake side with less than 10 min walk to beach down the cliff on a private path to sandy beaches of lake Michigan. If you are looking for a peaceful lake side cottage in harbor springs area for a small family, look no further . Cottage is excellently maintained by owners with all the emenities mentioned in the listing. Felt sad leaving the place after spending a peaceful relaxing weekend back to rat race n busy work life. Cannot wait to visit this paradise again. Thank you so much for the wonderful review. We are happy you enjoyed the cottage. It is our goal for families like yours to experience wonderful northern Michigan, the charming peacefulness of the tunnel of trees, and the Lk. Michigan shoreline. Sunbathing, Don't forget to bring your favorite water toys. Chairs provided for the Beach. New Casino and movie complex in nearby Petoskey.